Peter Dutro and Brad Spitzer, two leading figures of the Occupy Wall Street movement, who moonlight as businessmen, have eschewed the campfire comradeship for a room at a fashionable five star W Hotel Downtown. Peter Dutro, one of the members of elite finance committee, and Deloitte analyst Brad Spitzer, who covertly took part in protests while on a work trip from California, checked into the sumptuous W Hotel Downtown, The New York Post reported. W Hotel Downtown is a $700-per-night hotel, with 350-count Egyptian cotton sheets. Brad Spitzer said: “I’m staying here for work. I do finance, but I support it still. Brad Spitzer, 24, also offered other demonstrators respite from the weather in his decadent surroundings, requesting a roll-out bed to accommodate guests, according to The New York Post. “He’s here all the time,” a hotel source said. During their stay the scruffy set he draws into the hotel live it up like 1 per centers, hotel sources told The New York Post. Brad Spitzer denied accommodating demonstrators and claimed he simply offered a shower to a blogger friend living in the park. Meanwhile, Peter Dutro, 35, one of the small powerful team that decides how the movement’s $500,00 fund should be spent, arrived at the hotel the night after Zuccotti Park was cleared. Gordon Gekko is the name of the rogue trader played by Michael Douglas in the 1987 and 2010 Wall Street films that epitomise the greed that the Occupy movement claims to oppose. Confronted, Peter Dutro claimed to have chosen the W Hotel Downtown for its convenience. “I knew everything was going to be a clusterf–k in the morning,” he told The New York Post, referring to Occupy’s plans to bring the city to a halt. 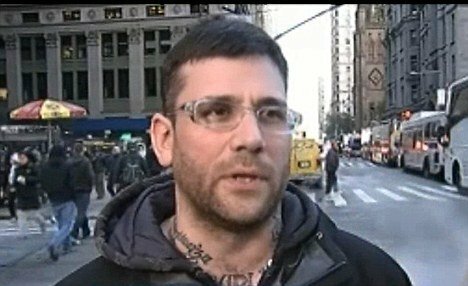 Peter Druto, a tattoo artist and former software project manager who dropped out of an NYU finance degree program to join the occupation said he paid $500 of his own money, using an American Express card, on the palatial surroundings. He wanted to get a good night’s sleep before the cause’s two-month ceremony the following day, he explained. “I knew . . . there was a high probability of getting arrested,” he said. “It is an expensive hotel. Whatever,” he said. Peter Dutro also claims that he looked after fellow protesters, who were staying in less salubrious surroundings. “I took food to all those churches,” he said. Other group leaders have stayed in both the W Downtown and the Marriott Hotel, the New York Post reported. Some key players were not present at the park campsite when police swept Zuccotti Park free of tents. 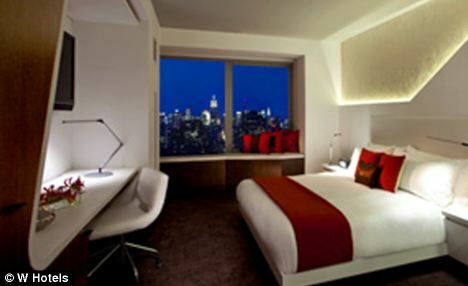 Rooms at the W Hotel Downtown have 37-inch flat-screen TVs, goose down duvets, rainforest showers and iPod-docks. A pastrami sandwich, from room service, costs an astonishing $18. "new york post" "bradley spitzer"